Welcome to the Rainforest & Reef Explorer Pre-Trip Information Page! Below, we have provided links to our Essential Information Package, and the associated information that you need to review prior to your departure to Belize. Have you considered any extra time in Belize before or after your scheduled trip? Below is a link to some suggestions, and we're happy to give you some advice on travelling anywhere in the country. The following Trip Preparation Guide is to properly prepare for your travels to Belize. This package includes your arrival logistics, trip packing list, tips for conditioning, extra information on fishing, background material on the country, etc. Included in this section is a helpful planning and need-to-do list, and links to documentation we require you to complete. Note: A notarized document is required for any children travelling with you (if one parent or guardian is not accompanying you). Anytime: Gloat as friends and family members look on with envy! Please download the Emergency Contact information and print off two copies. 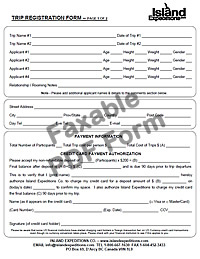 Please carry one with you and leave one version at home with family or friends so they can contact you in case of an emergency (please note this form is for your reference and is not to be returned to our office). The Emergency Contact form can be accessed below.